Basecamp is a web-based project-management tool. Basecamp helps you wrangle people with different roles, responsibilities, and objectives toward a common goal: Finishing a project together. It offers to-do lists, wiki-style web-based text documents, milestone management, file sharing, time tracking, and a messaging system. 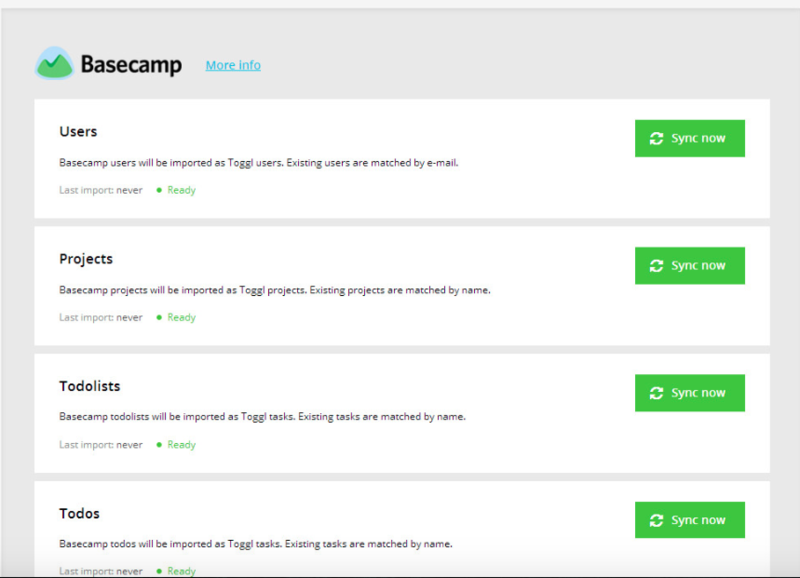 Note: Toggl’s integration with Basecamp is only available with Basecamp 2. The integration is not available with Basecamp 1 and 3. If you receive the error “Did not receive any accounts”, that means that there is no Basecamp 2 account currently integrated with Toggl. What can I import from Basecamp? All items will be matched with existing ones based on name. No duplicates will be imported. In order to get the process started, hit on the green "Select" button next to the account you want to integrate with Toggl. When you import users, there’s also an extra step where you can choose which users to import. Keep in mind that all Projects are imported to Toggl as public. This means that everyone in the workspace is able to see them unless the status of the project is changed to private in Toggl interface. All Projects, Todo lists and Todos are imported with the access settings of the user who authorized the integration.